The world’s most popular online platform for video sharing, YouTube, will soon be put to the test as a potential new platform for art expression in joint initiative with the Guggenheim Museum. Launched this year, YouTube Play. A Biennial of Creative Videos is a creative video competition and art project committed to the exploration of online video art. A media and an art institutions are cooperating to find out how the internet is changing the video art form and whether there is art in online videos – an emerging media which is continually establishing new ways to create, distribute and consume videos. The promotional imagery for YouTube Play. A Biennial of Creative Video. For the competition, each applicant may submit one original video entry of ten minutes or less that he or she has created in the past two years. When the competition closes for entry at the end of this month, a team of Guggenheim curators will review all the entries and create a shortlist of 200. A separate jury of nine professionals – from various disciplines such as visual arts, filmmaking, animation, graphic design and music – will then select twenty to be screened in four Guggenheim museums worldwide. All 200 entries will be available to view on the YouTube Play channel. The project provides an opportunity for anyone, albeit art professionals or amateurs, to submit an innovative, original video to YouTube Play to compete for the chance of having his or her winning entry shown in October in four Guggenheim museums simultaneously: the Solomon R. Guggenheim in New York, the Deutsche Guggenheim in Berlin, the Guggenheim Bilbao in Spain and the Peggy Guggenheim Collection in Venice. The jury is looking for innovative works that debate on, discuss, test, experiment with and elevate the video medium. They expect to see something “different” – not “what’s now” but “what’s next”. To express your thoughts and opinions of the biennial visit The Take, a platform for commentary and discussion of the project by Guggenheim-invited guests, staff, and web site visitors. Shahzia Sikander questions authority with new video art medium at Para/Site in Hong Kong – September 2009 – What was the product of Sikander’s 5 year study of moving image? Head of Schoeni gallery Nicole Schoeni told Art Radar that as part of the revamp of the website, there are plans to digitise their artist literature to form an on-line archive, “though it may take a while given that there is 16 years’ worth of material” she warned with a laugh. Nicole’s father Manfred Schoeni along with Johnson Chang of Hanart were pivotal in the nineties in bringing Chinese contemporary art to the international stage. For example Schoeni held the historically important 8+8+1 exhibition in 1997 which showcased the works of 15 contemporary Chinese artists many of whom are now internationally famous including Yue Min Jun, Zeng Fan Zhi, Zhang Xiao Gang, Guo Jin and Yang Shao Bin. Harnessing the web to share historically important art materials with a global audience is, perhaps surprisingly, still an unusual initiative. While museums are making big strides, few galleries as yet are making materials pubicly available even when this would help promote current exhibitions. No doubt this will change and we look forward to the day when research , images and interviews, previously locked down in print publications such as catalogues, are released to a wider web audience as a matter of course. In the meantime, Schoeni is also making its first forays into the world of video documentary with a just-released video of Chinese artist Zhang Lin Hai’s recent show ‘Stunned Speechless at Today Museum in Beijing. Zhang Lin Hai’s work often features a repeated signature motif of a bald male child against hauntingly bleak backdrops. This motif was born out of his own experiences of being adopted as a child and witnessing the devastation of the Cultural Revolution. Nicole Schoeni is featured in the video which shows the artist supervising the installation of his work in the museum space. VIRTUAL ART SHOW BY CHINESE ARTIST IN LONDON Opens 26 July 2008 for one year. 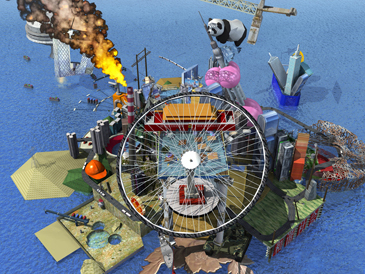 Beijing-based artist Cao Fei is creating RMB City, an online art community in the virtual world of Second Life. Institutions and collectors are invited to buy buildings in RMB City and programme events and activities in them. The project is an experiment exploring the creative relationship between real and virtual space, and is a reflection of China’s urban and cultural explosion. The Serpentine Gallery commissioned Cao Fei to develop this project, and it will be presented via the Serpentine website and in the Gallery’s lobby for one year. Cao Fei’s work was included in the Serpentine’s 2006 exhibition, China Power Station: Part I, held at Battersea Power Station.